Starting with the bottom row, position the interlocking channel sections on the wall as indicated by the shop drawings. Using the C-clamps, clamp the interlocking channel section into place on the aluminum or steel framing and screw the interlocking channel sections onto the steel framing. Do not exceed a maximum of 24" on center between interlocking channel. 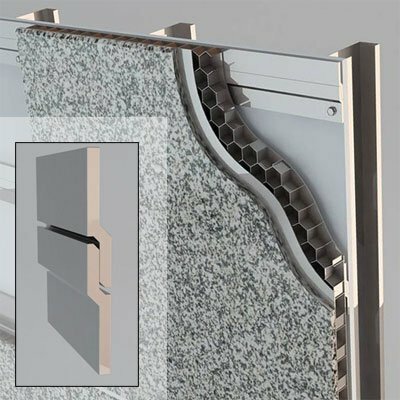 If steel framing is to be in direct contact with aluminum interlocking channels in a damp location, use paint or a similar barrier between the dissimilar metals to prevent corrosion. To attach the interlocking channel to the panels, lay panel face down. Mark the interlocking channel locations and attach the interlocking channel to the back of the panel with a bead of PL Premium Adhesive and #8 stainless steel metal screws.